Please email editor@skandinaviflorida.com or call 352-209-0244 for information about publishing articles or advertise you association or business with us. 4 - @Richard. Welcome to my blog, I am married to an American/Scottish clan Keith, if you are ever in the Tampa Bay area give us a ring or send an email! I just wanted to say hi, and that this is a really good site. I am scottish. not scandinavian, but used to have lots of visits and business with companies in Sweden and Denmark. I retired and live in Florida now, near Daytona. Found you because of the wikileaks links, but have you bookmarked now for all the other fun suff you have. 6 - @Vidar. Hello my Scandinavian fellow! I do hope you enjoy your Florida vacation. Next Friday we will elect a new president for the Scandinavian and Baltic Trade Association here in Tampa, for many years our president was the ever popular Norwegian Ivar Fiskaa. If you visit Tampa Bay or the rest of the beautiful west coast let us know! 10 - Jst a superb book about Finland. 11 - @John. I looked up your book, looks really interesting, my father had to leave Finland as a child because of the war. 12 - Hi All Swedes in the U.S.
We are two Swedish men who get up hope of finding drinkable beer in the United States / San Antonio. Is there anyone out there who over where to buy Swedish beer in the United States? 13 - Thank you for your friendly comments. I lived in Orsa, Dalarna for 4 years and actually only spoke Swedish as a youngster. Hag har glomt Swenska. "Sorry"
14 - @Anders. Yes, we have Swedish Beer in the US, Stockholm Beer is imported by a company in Sarasota, Florida, the beer is currently available in Florida, Georgia and Alabama. I guess you are in San Antonio Texas? Let me find out the plans for Texas from Ulf. I live in Fort Lauderdale, Do you have club near me? 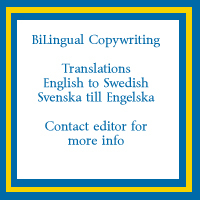 I would like to meet some Swedes to learn some Swedish and practice your langage. I speak, read, write fluent Chinese. My English is ok. I am in my early 50's and I think it is harder to learn another language. 16 - Hej allihopa! If any of you guys in Florida have an old volvo like pv444, p1800 or amazon, please stop by the volvo store in winterpark! I really want to see them! Jag kan prata svenska och heter Fredrik och jobbar pa volvo! "det ar inte farten som dodar utan det ar smallen! eller som vi sager in swenglish : it's not the fart who kills it's the smell!" 17 - Hi! Does anyone know where I can get lussekatter in the Tampa area this week for St. Lucia Day? 19 - @John. I am not sure I know what potato sausage is? Pls expiain or give the Swedish name and I am sure I can help you find a place to get it from. 20 - @Sand. You can find frozen lussekatter at IKEA Tampa, saw plenty of them there yesterday. Have a nice Lucia celebration! 21 - Hello, I am opening Central Florida's first Holistic Preschool in Winter Springs FL and I am in the planning stages for the Grand Opening festivities. I would really like to include a Maypole and if there are any interested local Swedish dancers, have them come to show, share and educate. Is there anyone who might be able to help me coordinate this, and also has a traditional maypole they could lend? I am planning the school's event for Sat May 2, 2015. Thank you. 22 - I am trying to find information/relatives of Mary Hansen. She was born as Marie Wilhelmina Abrahamsen 31/3 1907 in Tromsö, Norway. Married Trygve Hansen in 1931. Died in Lakeland, Florida in april 1987. 23 - Hi, i am a swede and want to move to orlando but i have no contacts at all there and don't no any about it actually so i wonder if here is some goldhearted person who would like to help me with good advice and get me in contact with other swedes. I plan to buy a house to so i need some info about good area and some some who can help me find a good living for a fair price. 25 - Hi. I work for an Assisted Living facility in Jacksonville, FL. We are having a celebration of Christmas around the world. I chose Sweden because of my Swedish descent. I was wondering if you had anything you could send me regarding Christmas in Sweden. Thank you. 26 - Greetings to all on this blog! I want to introduce my reenactment group: Danelagh Living History. Some of you no doubt saw our authentic Viking Folklife Village at the October Scandinavian Trade Association's Viking Fest in Tampa. We present the daily life of Norse peoples in the Migration Era, circa 800-1100 A.D., particularly in Viking Britain. We would love to work with Scandinavian heritage/history organizations for events and presentations. Like us (and message us, if you like) on Facebook! 27 - Please join us the Scandinavian Trade Association on Thursday evening, February 4, for our first networking event of the New Year! You are welcome to bring a guest(s) along. Families are also welcome! Me and my boyfriend and his 3 kids (13, 16 and 19years) are coming to florida this summer and will be in Saint Augustine during midsummer. Does anyone here know about any midsummer celebration around there? The only one I could find is the one you guys are having in Tampa. It´s a bit to far for us to go there.. The Scandinavian Trade Association's annual Julbord is the perfect opportunity to bring your family together to celebrate the holidays! While Julbord is a traditional Swedish event to celebrate Christmas, STA makes the event a true taste of Scandinavia, building on the fine Swedish traditions. The STA Julbord is an extensive spread that has evolved from a variety of Scandinavian traditions. Julbord is a classic Christmas dinner in Scandinavian countries. The word “Julbord” is made up of two parts: “Jul”, meaning Yule (synonymous with Christmas) and “Bord”, meaning table. Directly translated as the Christmas table. No matter what we celebrate, food and beverages are a central part of our festive traditions. It brings friends and family together, and Julbord comes to signify a specific event. Plan on a fun, family friendly event. This is a family friendly event where you can introduce your children and grandchildren, early on in life, to the flavors and smells of a holiday meal as much of an indicator of the celebration as the event itself. Our childhood memories turn into our own traditions, and soon we carry on the mantra of “it’s not Christmas time without Julbord. Who knows perhaps Julemanden will appear. The location for this year event is at one of our sponsor’s – the Tampa Brewing Company location in Westchase (across from the Oldsmar Flea Market) on Race Track Road. It will be held on December 3rd - starting at 6 pm - meal at 7 pm 8 pm entertainment – Santa Lucia ceremony will be held and we will also have entertainment, and Christmas tree lighting. Come in Scandinavian dress – free beer or refillable for soda for the night with ticket purchase. All this for $25 Adult, $15 children under 12, and free for those under 5. But seats are limited, so make reservations today!